Is Kevin Durant Really a Longhorn? You are a die-hard Seattle SuperSonics fan, the type who calls into 950 KJR to remind everyone about the time you watched Jack Sikma suit up for the first time in the green and gold. You attended every Save Our Sonics rally, wrote letters to Governor Christine Gregoire, and sent tithes to any effort designed to stop Clay Bennett and Aubrey McClendon from dragging your beloved team to Oklahoma City. Your twin sons are named Gary and Shawn. For the past four seasons, you’ve howled with rage as Kevin Durant — your Kevin Durant — has blossomed into the league’s most likable superstar. It’s the details that won’t allow you to move on — you obsess daily over the leaked e-mails, the dismissive comments from David Stern, the carelessness of Starbucks tycoon and former owner Howard Schultz. Forty-one years of community-supported history were taken away by powerful men who did exactly what powerful men do. Just when things look their bleakest and the years of protest have slowed down into the stuff of drunken eulogy, a homegrown hedge-fund manager sweeps in and proposes an arena plan that could placate even the city’s WTO-protesting anarchists who frown at “sport” and scream, “What about the children?” This arena, supported by the mayor and some of the Pacific Northwest’s most prominent businessmen, could be ready as early as 2017. So here’s the sticky question: With lust in your eyes, do you look 750 miles down I-5 at Sacramento and think, Who are they to have a team? This February, Chris Hansen, the 44-year-old president and portfolio manager of Valiant Capital of San Francisco, announced a proposal to build a state-of-the-art sports complex in the SODO (South of Downtown) area of Seattle, already home to CenturyLink and Safeco Fields. In May, the City of Seattle and King County both agreed to kick in $200 million in the form of bonds loans that would be repaid by tax revenue generated by the arena. Hansen has personally guaranteed the repayment of the bonds. Seattle has historically been bearish when it comes to public funding for stadiums — in 1995, a King County ballot measure to secure money for Safeco Field was voted down, and, as a result, the Mariners nearly left town. Ten years later, several different efforts to secure state money for a new arena for the Sonics were defeated, freeing a path for Bennett and McClendon to move the team to Oklahoma City. Despite Hansen’s guarantee that the project will not draw money away from public funding or create new taxes, some groups within the city, most notably the Port of Seattle, have registered their protest. The Port has argued that the new complex would increase traffic, restrict access to the harbor, and force out longstanding businesses that rely on cheaper leases. The Mariners have also expressed their concerns about increased traffic, but they haven’t gone so far as to officially oppose the project. Others have wondered how a hedge fund manager could actually guarantee $200 million in city funds. What if Hansen went belly-up? What if he turns out to be another Madoff? Last week, Hansen secured the support of Microsoft CEO Steve Ballmer, who, back in 2008, played a key role in a last-ditch effort to keep the Sonics in Seattle. Hansen also enlisted the Nordstrom family, one of Seattle’s legacied families. With Ballmer and the Nordstroms’ support, a guarantee to refund the bond loans no longer seems like much of an issue. Despite some opposition from City Council members, the arena proposal will most likely pass. There is, however, one condition to the arena deal that seems to have universal support: Construction cannot start until Hansen has secured an NBA team. On the day of the first rally for the new Sonics arena, I met Brown, Reid, White, Lund, and Baxter in a coffee shop near Pioneer Square. Brown had on a Shawn Kemp jersey and a baseball cap with the word “Robbed” stitched into the front panel. Reid repped Gary Payton. Baxter wore a green satin Starter jacket that would be the crown jewel of any hoophead’s retro wardrobe. In about a half-hour of excited conversation, the crew explained everything from their feelings about Oklahoma City fans — We do not begrudge them at all. It’s just hard to watch them be so happy — the kinship they still feel with Kevin Durant — “Seattle drafted Durant and he won the Rookie of the Year here. Now the NBA has scrubbed any image of him in a Sonics jersey from the public record1 — to their own basketball viewing habits — We probably watch the Thunder more than any other team. It’s kinda tough and slightly masochistic. At around 3:30, we walked a couple of blocks to Occidental Square, where roughly 3,000 people had gathered for a rally in support of the new arena. Chris Hansen was slated to make an appearance, along with Shawn Kemp, Gary Payton, Slick Watts, Aaron Brooks, Nate Robinson, and the Presidents of the United States of America. In the crowd, I saw a few dozen Kemp jerseys, roughly 30 Payton jerseys, and even a few Hersey Hawkins jerseys. Those George Karl teams from the ’90s still have hold on the imaginations of basketball fans in the Pacific Northwest. It seems fair to say that for Seattleites over the age of 25, Sonics basketball did not end with Kevin Durant’s rookie season in Seattle, nor did it end when Ray Allen, Rashard Lewis, Vlad Radmanovic, and Danny Fortson bowed out to the San Antonio Spurs in the second round of the 2005 NBA playoffs. 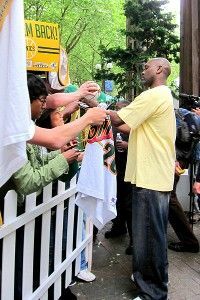 Rather, for the majority of Sonics fans who showed up to the rally, professional basketball ended when general manager Wally Walker traded Shawn Kemp to Cleveland and got Vin Baker in return. That sort of crooked history usually comes to an end when we realize that it’s no longer rational to invest real emotion into sports. The last high stands in for a childhood spent rooting for a team. Even if you continue to attend games as an adult, even if you purchase season tickets and show up at rallies, whenever you talk about your team, you still start with the phrase, “I’ve been a fan since _________.” I think most sports fans are aware, at least subconsciously, that it will never be as good as it was when we were kids, but we keep flogging it along in the hopes that Durant or Ichiro or Marshawn Lynch will do something that at least allows us to compare the new with the old (thereby opening up the past again). As I walked through all the old jerseys and old men at the rally, it occurred to me that the pain of losing your team comes, in part, from the inability to cope with the finality of adulthood. By nearly every modern standard, it is absurd for a grown man to devote four years of his life to the recovery of a professional basketball team. It is equally absurd to use the term “grassroots movement” to describe the process of wooing yet another $400 million franchise to your hometown. And yet, 3,000 people showed up to the rally for the new Sonics arena — most dressed in the jerseys of their childhood heroes — because there’s never a point when we stop trying to squeeze back within the cocoon of collective, shared nostalgia. Professional basketball can deliver that to an entire city — when everyone knows why you’re wearing your Gary Payton jersey, community is built. Similarly, when a really rich guy explains why he wants to build a new arena and bring back his hometown team, there’s a reason he always starts with his memories of weeping inconsolably after the Bullets beat the Sonics in the 1978 NBA Finals. For the first hour, the rally focused on social media. Kevin Calabro, the longtime voice of the Sonics, implored the crowd to “take out your smartphones and tweet your support for the arena to the City Council.” This message was repeated several times throughout the rally. The mood among the assembled crowd was overwhelmingly optimistic. Most seemed to think that it was only a matter of time before the Sonics would return to Seattle. Baxter told me his theory that the Grizzlies, who had been recently purchased by a San Jose tech mogul, were on their way back to the Pacific Northwest. His reasoning: The Grizzlies buyer had made his fortune in San Jose, which was close to Hansen’s business operations in San Francisco. What’s more, both Hansen and the Grizzlies buyer had spent time in San Diego. Nearly everyone I talked to at the rally had their own theory about which team was coming to Seattle. The consensus pointed toward the Kings. When asked about the irony of taking a team away from another city — especially one that has no other professional sports options — an overwhelming majority of fans admitted that in an ideal world, the Seattle SuperSonics would be an expansion team. But with no plans from the NBA to expand in the near future and with the grim state of the arena deal in Sacramento, those fans hoped that Kings fans would understand that the bigger market of Seattle would be the ideal spot for relocation. Reid pointed out that the difference between Chris Hansen and Clay Bennett was that Hansen wasn’t operating under false pretenses and that he hoped the fans and city officials in Sacramento would watch SonicsGate. “We provided a blueprint for exactly how a team can be stolen away,” Reid explained. “And a blueprint for how fans can fight to keep their franchise.” A kid in a “Beat OKC” T-shirt told me that David Stern and the NBA owed the city of Seattle a team for the transgressions of the past. Well, what kind of man is Chris Hansen? Like most men in his rarified tax bracket, he presents himself with studied, superhuman care. The Sonics pin on the lapel of his suit is almost presidential. His hair looks like it has been spun from something heartier than keratin. When he explains his plans for the area south of Safeco Field and how an NBA franchise can galvanize a city, Hansen speaks in bullet points, with no bluster wasted. For the man who will be the central hero-figure in the push to bring both hockey and basketball to his hometown, Hansen cuts an impressive yet thoroughly unassuming figure — he’s clearly the richest guy in the room, but you’d never know why or even by how much. The differences between Hansen and the typical multimillionaire extend beyond his stated social motivations. When he was in college, Hansen wrote a letter to the Ackerley family — then owners of the Sonics — informing them that he would one day own the team. Later, when Schultz took over, Hansen wrote to him, once again to state his intentions to one day own the team. Back in 2008, when Ballmer led an investment group that promised to make upgrades to Key Arena and offered to buy the Sonics back from Bennett and McClendon, Hansen pledged a stake of money. When asked why he didn’t lead the charge back then, Hansen said that his personal fortunes were not significant enough to allow him to become the majority owner and that he had been too occupied with his responsibilities to his family and the partners of his investment firm. Despite his early ambition and his involvement in the 2008 deal, Hansen hadn’t planned on owning a team for 15, maybe 20 years. He says he enjoys his privacy, something that has been compromised by the recent arena push. Valiant, despite Hansen’s individual success, still needs his guidance. So why now? Hansen’s defense fits neatly within the strictures of unassailable logic. “If a team is going to relocate anyway,” he explained, “we just want to be the market they go to.” His group has not employed “predatory” or “non-sensitive” tactics. Hansen did not name any names — during our meeting, the closest he came to directly identifying anyone or anything was when he admitted that his reserved personality wouldn’t allow him to become Seattle’s version of Mark Cuban. But every source in the league seems to agree that there is only one team left for sale in the NBA. That team happens to have gone through a lengthy, contentious deal for a new arena. That team also happens to have a dedicated fan base that has its own iconography of C-Webb, Bibby, Peja, Vlade, White Chocolate, and Lawrence Funderburke. That team sits in a larger television market than Portland, Charlotte, Salt Lake City, Milwaukee, San Antonio, Las Vegas, Oklahoma City, Memphis, and New Orleans. Chris Hansen might have never said the word “Kings” in our half-hour conversation, but if professional basketball comes back to Seattle, it will most likely come at the expense of the fans and the economic future of Sacramento. As part of the $45 million settlement that allowed Bennett and McClendon to break their team’s lease at Key Arena, the city of Seattle ceded control of its franchise’s history. According to the NBA record books, Gary Payton and Shawn Kemp’s jerseys should be hanging in the rafters at Chesapeake Energy Arena. If the Thunder win 65 games next year, they will break the franchise mark set by the 1995 SuperSonics. This, of course, is both meaningless and terrible. When the NBA returns to Seattle, the team will be named the SuperSonics. They will still wear the green and gold. The comparisons between the present and the past will still reference the players who are now in Oklahoma City’s record book. But the act of hijacking a city’s history, the needlessness of taking phrases like “the most points scored in a game since Downtown Freddie Brown scored 58 in 1974,” shows just how much of a business the NBA has become and just how little a relocating team cares about the fans they left behind. And why should they? These Finals, played by two teams in relatively small television markets, have seen some of the biggest ratings in the history of the league. Localism and its effect on a team has been diluted to the point where there are probably more Kevin Durant fans in Los Angeles than there are total people in all of Oklahoma City. Attendance numbers no longer matter as much to the financial health of a franchise as television deals and whether or not you can fit 500 people into the brewery you build next to the arena. The old methods of fan protest, which mostly involved not buying tickets, have lost much of their power. Even at an event like a rally to bring the Sonics back to Seattle, the focus, at least politically, was on getting people to register their support through social media. The NBA has evolved into an open-access, floating world. Its fans, both domestic and international, have never had more access to the game. A franchise’s ties to its local community and economy have never meant less. There is no doubt that Seattle “deserves” an NBA franchise. There is no doubt that Sacramento “deserves” to keep its own. But when it comes to the high-stakes game of team ownership in the NBA, deserve’s got nothing to do with it. This is emphatically and undeniably true. Think of all the Durant highlight reels you’ve watched over the past two months. Have you ever seen him wearing the green and gold?